A doctor tells a patient they need a knee replacement, even though the knee just started hurting a few weeks ago and no other treatments have been attempted. Progressing to surgery without trying less invasive treatment first is generally not advisable. Most of the time, the physician would try to determine if the patient had tried any of the over-the-counter arthritis medications such as Aleve, Ibuprofen or even Tylenol for a period. In addition, there are prescriptions for arthritis medications that cause fewer stomach problems, but cost a bit more. For many people these medications work well for many years. 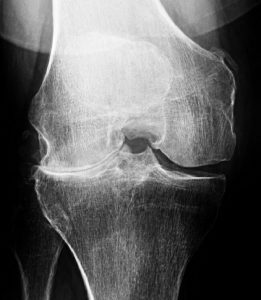 If the time comes that these medications don’t help, most surgeons will try injecting cortisone into the knee, which is a more potent anti-inflammatory medication than are the oral medications. Again, most patients get considerable relief from periodic injections and are able to handle the pain of arthritis much better. Generally, these injections can only be given 3-4 times a year, as they have a detrimental effect on the joint if given more often. In addition, patients and physicians often overlook the real benefit of a well-conceived and monitored exercise program to help strengthen the leg, lead to weight loss and toughen the mind to pain. This requires real dedication by the patient who may or may not be motivated to keep up with the program. Nevertheless, all of these treatments should have been considered before surgery is discussed to any extent. Questioner: My mother said that her surgeon told her that her X-ray showed arthritis and this is why she was advised to get surgery right away. Isn’t that what an X-ray is for? Dr. Zehr: Let’s step back for a minute and consider what brought your mother in to the surgeon. She came in for pain in her knee. Frequently, an X-ray is one of the first tests chosen for joint pain because it is simple, painless and can readily be obtained in a physician’s office. There are literally hundreds of diagnoses that can cause pain in the knee. To sort through this considerable list of possible diagnoses, the surgeon has at his disposal dozens of tests that can be considered. In the course of your discussion with the surgeon, he will have considered when the pain started, what has been done to treat this pain, what other medical problems you have (such as hypertension, diabetes, kidney disease) and what level of activity you expect from your knee. Then he will consider your X-ray picture, which may very well show advanced arthritis of the joint. This X-ray should in no way be the sentinel signal to the surgeon that surgery is needed right now, or even ever. Again, an X-ray is merely a tool and should be used as only one data point to consider among many to direct treatment. Questioner: So you don’t believe that an X-ray that shows advanced arthritis, even bone-on-bone arthritis, is a primary indicator for surgery? Dr. Zehr: Absolutely, without hesitation – NO! I have been in practice for over 25 years and have seen many thousands of patients X-rays that show bone-on-bone arthritic deterioration of their joint. Many, many of these patients present with the same short-term time frame of weeks to months of pain as did your mother. If the X-ray showed bone-on-bone wear—her knee has been wearing down for over 10 years and has probably been bone-on-bone for the past five. It makes no sense to me to tell a patient who has been bone-on-bone for many years, but just now presents with recent onset pain, that they need immediate joint replacement surgery. Again, the X-ray is merely a tool to establish a diagnosis—in this case arthritis. We start at the beginning with medication, injections and exercise, and encourage weight loss, because in the vast number of cases—this works to diminish pain and maintain function. Best of all, the patient keeps their own joint for the time being. It should be obvious, but if not—your own joint is much better than any artificial joint currently on the market, so it makes sense to get as many years of function out of it that you can. Questioner: It seems that you have a very conservative, non-surgical approach to arthritic joints. Isn’t this unusual for a surgeon? And in the case of my mother and patients like her who have been told they need surgery, but are unsure—what should they do? Dr. Zehr: Arthritis is a chronic condition that takes many years and even decades to evolve to its final stages. It may not even cause pain until it is very far advanced – bone-on-bone for instance. Even in that setting, it is perfectly reasonable to expect relief of the pain by utilizing many of the non-surgical steps we have already discussed. If you have been advised to have joint replacement surgery based solely upon an X-ray that was taken—even if it shows bone-on-bone arthritis—and no other treatment has been tried, a little warning bell should go off in your mind. It is my strong advice that you get a second opinion, from an experienced, well-known surgeon in the field. Arthritis is not lethal so you have time to seek other professional advice. I have had patients literally walk into my office with their overnight bags packed, ready to go to the hospital for surgery when they came in for a second opinion, only to find out that there were still several other treatments to try before a surgical procedure was going to be considered. Their puzzled stares quickly turned into joy at the prospect of avoiding surgery, keeping their own joint and leaving with the knowledge that they control their own destiny as it pertains to their joint. I couldn’t be more emphatic in my recommendation to anyone who has the slightest doubt in his or her mind about a surgery, to get a second opinion. If the second opinion agrees with the first, your confidence will raise; if the opinion is different, it will spare you a surgery whose time has not yet come.